One of the centerpieces of the traditional Jewish wedding is the bestowal of a ring by the groom on his bride. This constitutes the fulfillment of an essential component of the Jewish marriage rites, the giving and free acceptance of an article of value. Traditionally, the ring is placed on the forefinger of the right hand during the ceremony. Explanations differ as to why this is the case. Some hold that there was an ancient belief that an arterial lifeline ran from the index finger directly through the heart, and thus accorded that finger particular significance. Others maintain that because the forefinger is the most used and active one, by allowing a ring to be placed on it a woman signified her voluntary and active acceptance of the marriage agreement. In some Sephardic communities, by contrast, the ring is placed on the left middle finger. The reason given for this is that this is the same finger that one binds with the t’fillin, and just as that indicates that someone is bound to God, a ring on that finger indicates that one person is bound to another. Most women move the wedding band to the third finger of the left hand after the ceremony is over. The giving of the ring is preceded by a repetition of the verse Harei aht mekudeshet li betaba’at zo k’dat Moshe v’Israel. (Thou art sanctified unto me with this ring, in the tradition of Moses and Israel.) The giving of a ring in the traditional ceremony indicates that the groom has provided for certain guarantees of his wife’s well-being in the event of the dissolution of their marriage. 1. The groom or his agent gives the ring to the officiant. 2. The groom identifies the witnesses. 3. The witnesses attest that the ring meets the specifications of Jewish law: that it is made of pure metal, is an unbroken circle without any holes or interruptions, and that it is free of gems or other embellishments. 4. The groom attests that the ring is his legal property and is of the required minimum value. 5. The groom takes the ring from the officiant, and recites the Hari aht verse. 6. In sight of the witnesses, the groom places the ring on the bride’s right forefinger. The traditional Jewish wedding ceremony makes provisions for the groom to bestow a wedding band on his bride – this was part of his assurance that she would be provided for in all circumstances. Many modern couples, alternately, have a double ring ceremony – one in which each partner gives a ring to the other – in keeping with their egalitarian values. 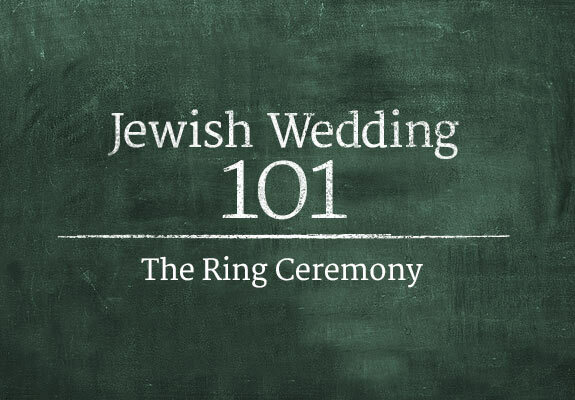 If you would like a double ring ceremony be sure to discuss this with your officiant: some Orthodox and Conservative rabbis believe that halachah (Jewish law) does not permit double ring ceremonies, or that it imposes some limitations on the way in which they may be performed. Another means by which the ring ceremony may be made more egalitarian is by having the bride verbally respond to the groom and formally accept the ring. 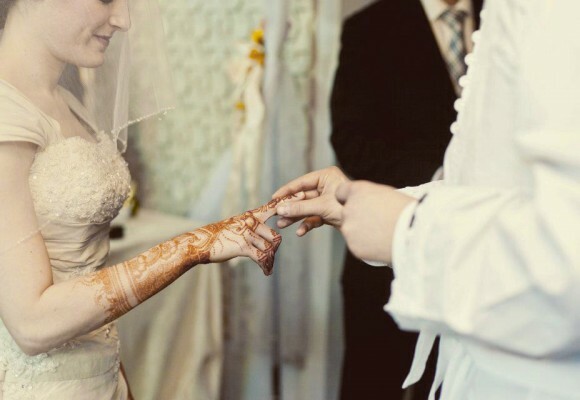 Some Orthodox and Conservative rabbis have recently begun introducing this practice to couples that wish to give a more active role to the bride during the wedding, while also adhering to tradition.